Following on from yesterday’s Flight of top sweet wines, today it is all about Sauternes, with the excellent 2013 vintage on offer. 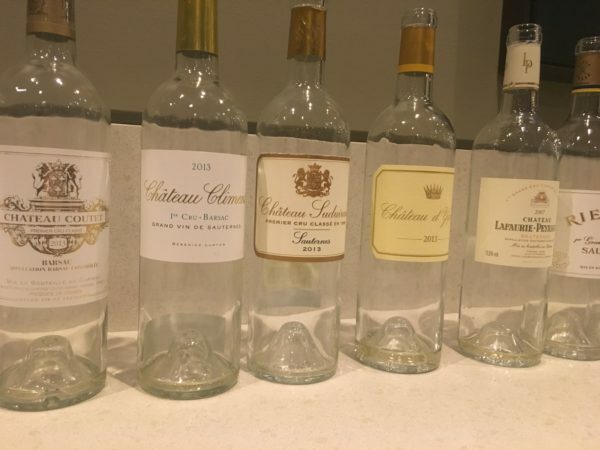 2013 is considered to be a top-flight Sauternes year, albeit with very low yields. Called a ‘great vintage for rot’, the only main challenge was some mildew in amongst the more noble rot. This bracket was split into Barsac and Sauternes, which is always in instructive split. Of interest is soil type, with Barsac more red clay-based and with limestone closer to he surface. According to Sandrine, Barsac shows ‘more grapefruit and white peach… more lively with a lighter structure’. while Sauternes is ‘more ripe fruit and fuller bodied’. 100% Semillon. Creamy nose. Love the creme custard style here – really balances up all the Limey fruit but with the oak richness and fruit length to carry things forward. Delicious and complete, the very archetype of Sauternes. Lovely, faintly bitter finish. Light and lemony. More acidity compared to some in this lineup. 18.5/20, 94/100. 93% Semillon /7% Sauvignon Blanc. Lemon and bright fruit nose. Juicy and full palate is exuberant and full of flavour. More fruit compared to some in this lineup, perhaps even more sweetness. Doesn’t hurt though, and the finish is somewhat dry. Again, delicious and ticks every Sauternes box. Difficult to pick favorites between these two. Heavier than the Barsac. Immediately more heavy. The extra complexity propels this above the Climens. 18.7/20, 95/100. 80% Semillon/20% Sauvignon Blanc. Average yield is 10hl/ha. 100ha estate. Very biscuity and grandiose nose. Lots of oak playing forward. A huge mouthful of lemon, pineapple pieces, golden honey and then big yellow fruit flavours. What a wine! A giant of a wine, with a wall of yellow fruit flavour. So much grander in every way, though not as pretty compared to some. What a wine! 19/20, 96/100.